Courtesy City of AspenA proposed change at Aspen's Anderson Park would relocate a privately held lot within the park to near the corner of Highway 82 and Cooper Avenue, creating a better space for future park uses. ASPEN – Aspen’s Anderson Park, a relatively little-known spot along the Roaring Fork River, could become a lot more familiar to local residents by May. City voters may be asked to amend a subdivision plat to, in essence, carve a residential lot out of the park. The city would gain an existing, private parcel that juts into the park, hampering its use. The deal has been a matter of negotiation between city parks and open space officials and the private landowners for some time, according to Stephen Ellsperman, city parks and open space director. Though the city has owned the 1.25-acre park for more than a decade, it has made no formal plans for how the property might best be used. Gaining the land occupied by the private parcel, which was fenced last summer, in exchange for an equally sized parcel elsewhere in the park, would facilitate public use of the area, Ellsperman said. Both the park and the vacant, private parcel are located off Highway 82 on the east side of town, sandwiched between the Roaring Fork River and Riverside Drive. Once owned by William and Hildur Anderson, the property was subdivided in 1979 and the Orr family purchased Lot 2. In 1999, the city acquired Lot 1, securing it for an envisioned trail along the river and other public park uses. Lot 1 surrounds Lot 2 on three sides. The park contains a cabin that apparently dates back to the late 1930s, where a parks employee resides, and several smaller outbuildings. The proposed plat amendment would create a new lot, closer to the intersection of the highway and Riverside Drive, for the Orrs, and open up all of the back end of the park, farthest from the highway, for park uses. 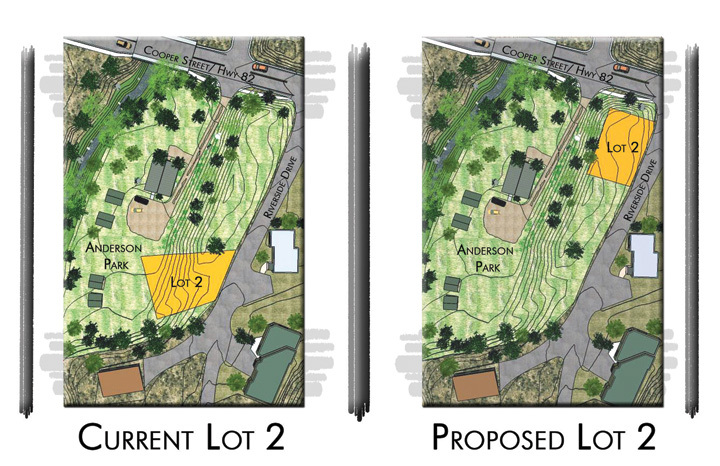 “Simply put, this lot line adjustment will allow for the owner of Lot 2 to develop an area of Anderson Park that isn’t critical to park use and allow for the preservation and protection of the park space for public use,” said a letter to neighboring property owners. No money would change hands as part of the deal and the city land-use code will guide any development that occurs on the Orrs’ new lot. At present, the park does not see heavy use, though some residents have discovered its attributes. “People come and fish, people do come in and walk around – it’s fairly contemplative,” said Brian Flynn, open space and special projects manager for the city. A master plan for the park, which would determine future development of park facilities, if there are any, will await the outcome of the proposed lot adjustment. The proposed subdivision plat amendment will go to the City Council for a first reading on Feb. 28. A second reading is scheduled March 28. At that time, if it is approved, the council would also be asked to put the matter on the May ballot, Flynn said. A change involving city-owned open space requires voter approval.